Teenagers and their technology are inseparable, but a new poll shows Black teens are the most likely to have access to smartphones—which could explain why they’re the biggest and most frequent users of mobile-friendly social media apps Snapchat and Instagram. 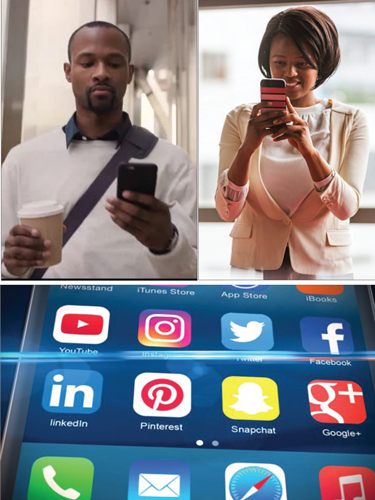 A survey released April 20 by The Associated Press-NORC Center for Public Affairs Research explored teens’ social media use and its relationship to race and class. The poll found that nearly 9 in 10 Black teenagers use Snapchat, compared with just over 7 in 10 Whites. And 4 in 10 Black teens report using Snapchat almost constantly, compared with about 2 in 10 White teens. A third of Black teens say they use Instagram almost constantly, compared with about 1 in 5 White teens who responded similarly. Overall, teens with access to a smartphone are more likely to use Instagram than those without one—80 percent compared with 37 percent. The same is true for Snapchat, 79 percent compared with 40 percent. Just 6 percent of the 13 to 17 year olds in the study said they don’t use any of the common social media platforms. Among all teens, the poll shows three-quarters use Instagram and Snapchat, more than the two-thirds who say they use Facebook. And while texting is still the way 9 in 10 teens send short messages, 4 in 10 also use a messaging app, such as Kik, WhatsApp, Skype or Facebook Messenger. Thirty-four percent of Black teens surveyed responded that they use three or more messaging apps, compared with 20 percent of White teens. More than 9 in 10 Black teens—95 percent have access to a smartphone, compared with 89 percent of Whites and 86 percent of Hispanics. While this may make them savvier on social media and messenger apps, the technology could be a handicap in education or employment, especially for teens who don’t have access to other types of devices. Lower-income teens are less likely to have tablets or traditional desktop computers, which cost more and can make tasks like writing a paper, doing homework or filling out a job application easier. The poll shows that older teens are more likely to be frequent users of Snapchat, Instagram, Facebook and Twitter, and are also especially likely to have access to a smartphone. Hope Wright only uses her iPhone for social media—never her laptop, which she uses only for schoolwork. She said she only sends texts to friends and family. And the Wilmington, North Carolina, eighth-grader said that even when she is on Snapchat or Instagram, she’s mostly lurking and doesn’t post often.